© Posted on January 15, 2018, by Michael E. Newton. “All the proceedings in the said case” were “transmitted” from Nevis to the Privy Council in Great Britain “under the seal of the said island,” but unfortunately the original proceedings and the copy sent to the Privy Council have not been found and may no longer exist. * Courtesy of the U.K. National Archives. 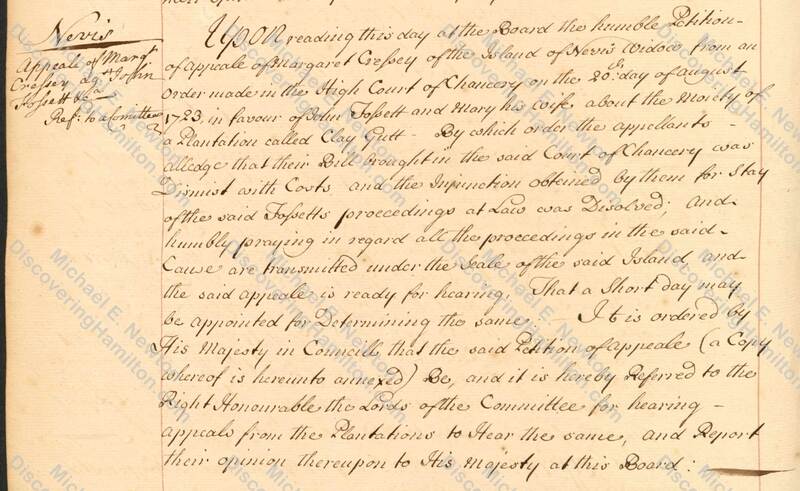 A motion was made “for a day to be appointed to hear the appeal of Margarett Cressey widow against John Fauscett and Mary his wife from the island of Nevis.” The “Lordships” of the Privy Council agreed and the motion passed. 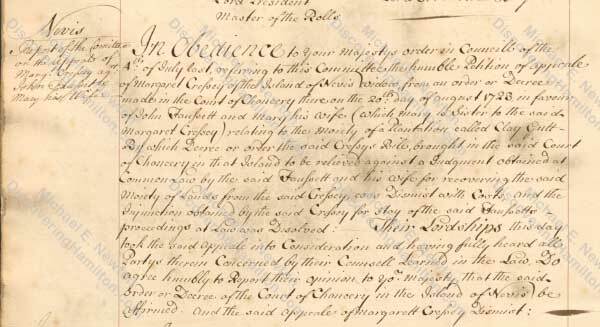 In obedience to Your Majestys order in Councill of the 4th of July last referring to this Committee the humble petition of appeal of Margaret Cressey of the Island of Nevis widow from an order or decree made in the Court of Chancery there on the 20th day of August 1723 in favour of John Faussett and Mary his wife (which Mary is sister to the said Margaret Cressy) relating to the moiety of a plantation called Clay Gutt… Their Lordships this day took the said appeal into consideration and having fully heard all parties therein concerned by the Counsell learned in the law, do agree humbly to report their opinion to your Majesty that the said order or decree of the Court of Chancery in the Island of Nevis be affirmed and the said appeal of Margarett Cressey dismissed. Thus, Margaret Cressey had lost her appeal. John and Mary Faucett, Alexander Hamilton’s grandparents, had emerged victorious in this dispute over a moiety of the Clay Gutt plantation. This piece of information is the first ever found regarding Mary Uppington outside of her connection to John Faucett. Nothing had previously been known about Mary Uppington’s origins or family. 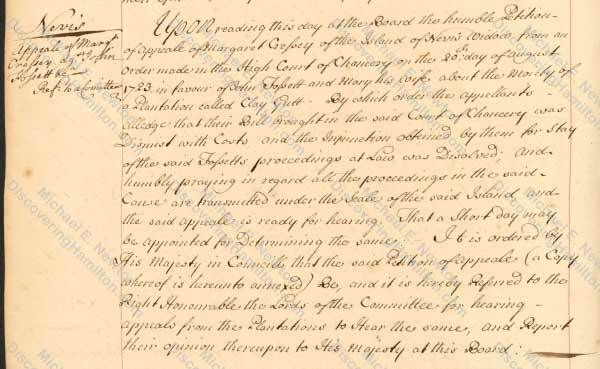 For the first time, we now know that Mary Uppington had a sister named Margaret who married a man with the last name of Cressey. This is especially noteworthy because in St. George’s Parish, Nevis, the same parish where John and Mary Faucett lived, a “Margaret Uppington, Spinster” married “Edward Evans, Mason” on December 26, 1721. In an endnote to Alexander Hamilton: The Formative Years, I speculated that this Margaret Uppinton “probably” was the sister of Mary Uppington. Now that a different Margaret has been identified as the sister of Mary Uppington Faucett, this Margaret Uppington Evans almost certainly cannot be her sister (unless Mary had two sisters with the exact same name). It is still likely, however, that this Margaret Uppington is related to Mary Uppington Faucett and her sister Margaret Cressey, especially as all three are found in St. George’s Parish, Nevis. Unfortunately, little is known about the personal life of Margaret Cressey. In every record I have been able to find regarding her, she is referred to as Margaret Cressey, Mrs. Cressey, Madame Cressey, or “the widow Cressey.” No record of her prior to her marriage has been found, nor has the first name of her deceased husband been located. She may have been married to Thomas Cressey, who was on Nevis as early as 1697 and was married to an unidentified woman on Nevis by 1699, suffered losses in the French invasion of Nevis in 1706, and was buried in St. George’s Parish, Nevis, on March 9, 1718. An Anne Cressey, perhaps the daughter of Thomas Cressey and/or Margaret Cressey, also appears in the records of St. George’s Parish marrying a “Mr. 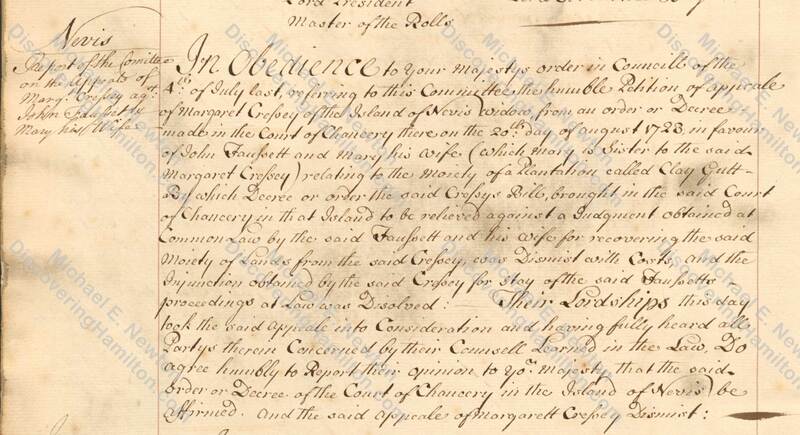 John Lane of the City of Cork in the Kingdom of Ireland” on December 21, 1718. They had a child together, William Cressey Lane, on August 9, 1720, but this son was buried less than a month later on September 2, 1720, all of which took place in St. George’s Parish, Nevis. Margaret Cressey is undoubtedly the “Mrs. Cressey (from Nevis) Widow” who passed away on St. Kitts on April 27, 1734. Even though little is known about Margaret Cressey, her name provides Hamilton researchers with one more thing to look for when investigating the story of Alexander Hamilton’s grandparents John and Mary Faucett. Additionally, the connection of the Faucetts to the Clay Gutt plantation provides yet another potential avenue of investigation for researchers. Perhaps, some yet-to-be-discovered record of Margaret Cressey or Clay Gutt will give us new information and insight into the lives of Alexander Hamilton’s grandparents, great aunt, and other relatives living in St. George’s Parish, Nevis. Clay Gutt or Clay Ghaut was located in St. George’s Gingerland Parish, the same parish in which the Faucetts lived. Clay Gutt reportedly adjoined the Faucett plantation (Mitchell, Alexander Hamilton: Youth to Maturity 4 and 470 note 14). 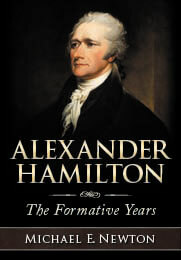 Newton, Alexander Hamilton: The Formative Years 530 note 154. Calendar of State Papers, Colonial Series, America and West Indies, October 1697 – December 1698 581, 594; ibid. 1699 40, 45–46. Thomas Cressey is found in the same documents written about previously on this blog regarding the French invasion of Nevis in 1706. Next Next post: Where Did Alexander Hamilton Live While Attending Grammar School in Elizabethtown, New Jersey?